I've done a lot of interviews as a reporter, but none like the conversation I had with Pinchas Gutter. Gutter is an 85-year-old Holocaust survivor who lives in Toronto -- and I spoke with a digital version of him. Gutter was the first to participate in a new format being pioneered by the USC Shoah Foundation. He sat in 2014 for more than 20 hours of interviews, recorded by 116 cameras, and answered about 1,500 questions. His responses formed a database that powers Gutter's digital persona. The digital Gutter uses speech recognition and natural language processing to recognize questions and surface appropriate responses. The USC Shoah Foundation was established by Steven Spielberg in 1994 to document first-hand accounts of the Holocaust for future generations. 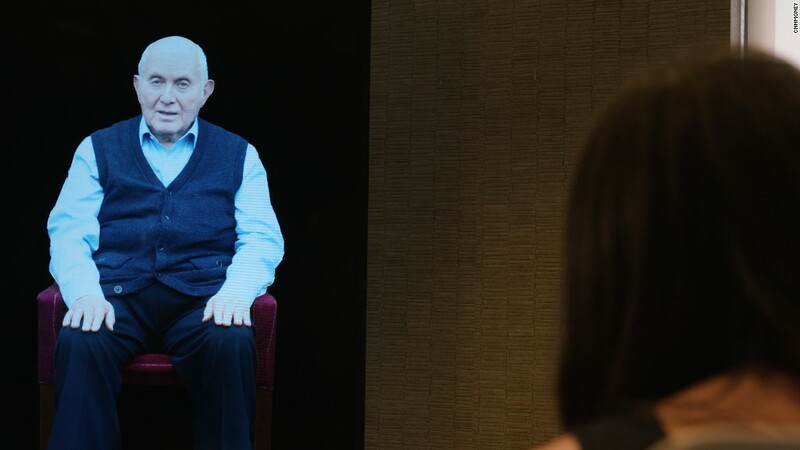 The foundation has been archiving video testimonies of 55,000 Holocaust and genocide survivors, while also exploring innovative ways to bring their stories to life. "We preserve the authentic voice of the individual, and then that is what you engage with in the future, not some digital version or avatar version of it," said Stephen Smith, executive director of USC Shoah Foundation, who first met Gutter in 1998. "There's a lot of tech involved but you don't see it. You shouldn't see it." A beta version of Gutter has interacted with people at numerous museums since 2015. As more people engage with him, Gutter's digital form becomes smarter because developers can learn how people are interacting with him. They can tweak his understanding of their questions so he can give the best answers. "The purpose of this interactive conversation is to allow the user to explore [Gutter's] experience with their own curiosity. To get a deeper sense of empathy for that experience because it connects to them as an individual rather than being an abstract," said Smith. Gutter's digital form does have some limitations -- for now. "[He] does not yet have the ability to track the conversation," said Smith, noting that this makes followup questions challenging. "If you ask about 'them' -- he doesn't necessarily know which 'them' it is." At the start of every question I asked, I clicked a computer mouse and released it when it was time for Gutter to answer. Interacting with Gutter, who is Polish and was just seven years old when the war broke out, felt like I was on a Skype call. I could ask him all the questions that I could never imagine asking my grandparents, who were also Holocaust survivors. I found myself wishing my grandparents were available to me in this digital form. Instead of relying on my memories, their voices and their mannerisms would be available for me to still engage with today. "What's the worst thing you witnessed at the concentration camps?" I asked Gutter nervously. He told me about the time, on a death march, one young man who was considered to be a favorite of a guard's had overslept. The digital persona answered: "This corporal ... put him between his legs, took that wooden gun and shot him. ... I remember his legs twitching ... this happened in 1945, and yet, I can see it as clearly as him lying there and everything exactly the way it happened." While I didn't interview the real Gutter, I felt as if I had. A dozen Holocaust survivors, and a Chinese survivor of the 1937 Nanjing Massacre, are being turned into digital forms like Gutter as part of the New Dimensions Testimony project. New Dimensions Testimony, developed by the Shoah Foundation, will be on exhibit this summer at the New York Jewish Museum. And Gutter's story is also playing out in other formats. A virtual reality experience, "The Last Goodbye," is debuting at the Tribeca Film Festival. Gutter traveled back to Majdanek, one of the concentration camps he survived, to share his memories in the very place they originated. Smith and Gutter are also coauthoring a memoir. Smith said the recordings have been "future proofed" so when new tech innovations develop, the stories of survivors like Gutter can be adapted. Gutter's digital form someday will be an interactive hologram. For now, the focus is on collecting testimonies of survivors. "We have to do it now or it won't be recorded for the benefit of the future," he added. "We have a race against time ... You can't replace a human being, but what this does is close the gap a little and create that intimacy and empathy that you might get talking to a real human being."